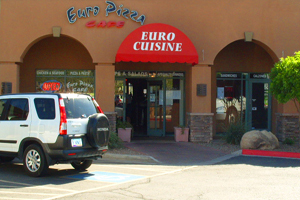 Pizza, Italian Cuisine, Bar — True to their name, Euro Pizza Cafe Pizzas and Calzones are second to none. Whether you select one of their handmade masterpieces or make your own from their selection of fresh toppings, you will not be disappointed. Come in today and try for yourself. Euro Pizza Café strives to create an oasis from your daily routine by serving great tasting food in a pleasant, relaxing atmosphere. Enjoy a relaxing meal on their patio. They offer the closest dining to the world-famous fountain. All of their entrees are made from scratch and prepared to your order using only the highest quality seafood, meats, pasta and the freshest vegetables.